A sports journalist narrowly cheated death on his honeymoon after a plane in which he and his new bride were travelling fell out of the sky from 4,000 feet. Jersey Evening Post sports reporter Jason Fox and his wife Sally were on an aerial volcano sightseeing tour in Vanuatu when the single-engine Cessna aircraft in which they were travelling. The Cessna’s engine had spluttered and fallen silent before the pilot urged passengers to put on life jackets as the plane began to drop out of the sky from about 4,000 feet. Jason, 30, and 26-year-old Sally escaped unharmed from the wreckage after the plane hit a line of trees 100 metres short of a grass runway. In a video filmed on his phone at the crash scene after the incident, Jason said: “So, we’ve just been in a plane crash and I’m not joking. Jason had to help an Australian tourist, who suffered a suspected broken ankle in the crash, away from the wreckage. Speaking later from his hotel, Jason told the JEP: “The engine started to splutter. Then it all went silent and we just started to float and then drop and the pilot started pulling on his levers and then said ‘get your life jackets on’. The engine had cut out as the plane was passing the island of Erromango, and the pilot tried to steer the plane towards a grass runway. Jason added: “We had gone over the island earlier in the day as we flew towards the volcano and I saw that it had a grass runway. 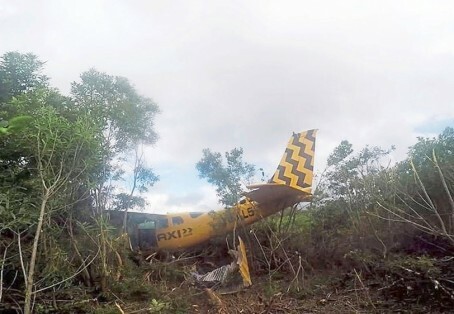 After the engine stopped, as we got lower and nearer the airstrip I thought we were going to be OK, but we fell short of the runway and ended up crashing into trees at ground level at pretty much full speed. “Sally crashed forward into the guy in front and I hit my head on back of pilot’s seat. I think I might have a bit of concussion but Sally is OK. I hope he claims expenses for the story. Hell of a tale for local paper. Great tale. I think the phrase rhymes with ‘clucking bell’. Glad they’re all right. Expenses.. and a day off in lieu! So glad everyone made it.